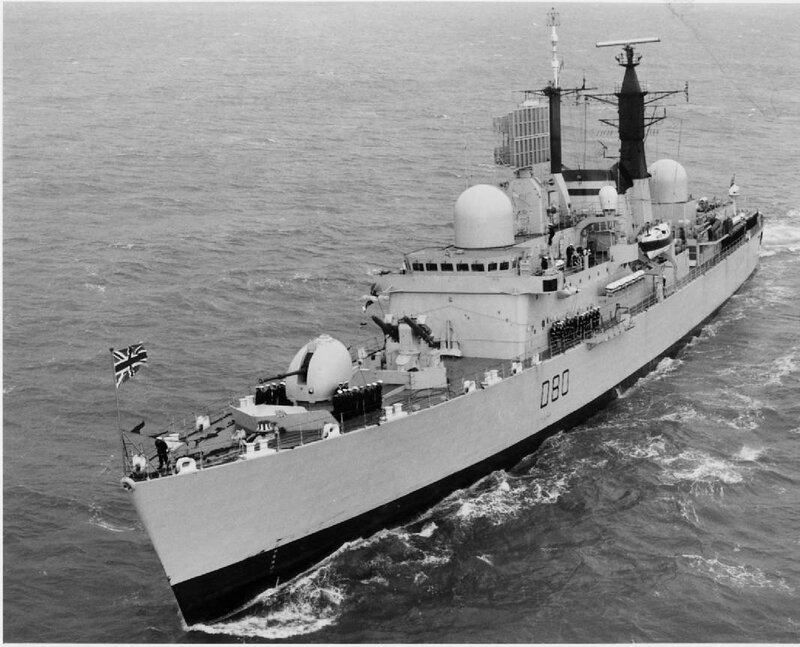 HMS Sheffield, a modern computerised Type-42 destroyer, had been returning to Portsmouth from a patrol in the Arabian Gulf, her crew looking forward to some well earned R & R.
She was the second ship to bear the name. The first was a 591ft Southampton Class cruiser that had helped sink the Bismark in WW2, and had a proud battle history. When decommissioned in '67, many of the stainless steel fittings (presented by Sheffield companies, distinct from normal brass fittings) that had given the ship the nickname "Shiny Sheff" were added to the new Sheffield, enduring the name and keeping the distinction. The call to join the Task Force came within hours of the Argentinean invasion of the islands, and when the crew were just four days from Portsmouth. Some of the crew would never see home again. On Tuesday May 4th the ship was on forward radar scouting patrol, around 70 miles south and east of Port Stanley. Meanwhile a pair of French made Super-Etenard fighter-bombers from the mainland Argentinean base of Rio Gallegos spotted the HMS Sheffield on radar about 50 km away. The planes headed closer, at 20km fired off a pair of AM 39 Exocet missiles, then peeled off toward home. One of these Exocets locked onto the Sheffield. These missiles quickly dropped to between six and eight feet from the sea and travelled at close to the speed of sound through rough waves, following a course programmed in by the pilots. 10km from the target the missile's own radar system picked out the target and homed in. One history of the Falklands war says that as there were no "bogeys" on any radar screens at the time, the officers were making a satellite phone call back to Fleet HQ in England, an action that would jam the use of the ship radar. However, with other ships close by, notably the Carrier Invincible, this was not seen to be a risk. At the end of the call, reported the Guardian newspaper, the radar came back on and the two Etenards were spotted just 33km away. It was the Navy's first encounter with low-flying Exocet-carrying attack planes. 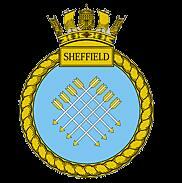 Another history says that the Sheffield's crew were "only in second-degree readiness rather than at full action-stations". The first the crew heard was a loudspeaker warning "Missile Attack - hit the deck". It reportedly took four minutes to close a ship down into battle stations and to be ready to take evasive action. The Sheffield had little more than a minute to react. One of the missiles missed the target, but the other hit the Sheffield square amidships, penetrating deep into the the electronic fire control room. It apparently failed to explode but ignited everything around it - flames fuelled by the missiles own propellant. It came in low, about six feet above water level, and exploded outward and upward. The whole working area of the ship was in flame and poisonous smoke quickly engulfed the ship. 21 men lost their lives and a further 24 wounded. One of the men who died was Senior Computer Chief Mike Till, from Houghton-le-Spring , Co Durham. When the missile hit his team stayed at their posts. They were working to get the ships computers back on line so that she might be able to defend herself, unaware that the planes responsible for the attack were long gone. Sadly it was too late for these men to escape the fire, smoke and fumes. Mike and his men all failed to survive. This was the moment when everyone realised that there was more to 'signing-up' than learning a profession and seeing the world. From here on the gloves were off and guns did all the talking. The Newspapers rallied to the call, and loudly declared that Our Boys were out for vengeance. Today controversy still rages, as veterans continue to fight for an inquiry. How could one of the Navy's newest ships, specifically built to defend against missile attacks, be almost literally be caught napping. Key documents appear to be "lost" , and several men from HMS Invincible allege that officers knew of the presence of hostile aircraft a full 19 minutes before Sheffield was hit and failed to notify other ships. Sightings were apparently dismissed by a senior officer as "spurious". One operator reported that he and others were accused of "chasing rabbits", and that he is haunted by the memory of his commanders' inaction that day. One fact though was inescapable: HMS Invincible was positioned in direct line with the incoming. Had the Sheffield not been there, then it could have been a totally different story. The MOD have consistently ruled out an inquiry and key documents are not to be released. Meanwhile Portsmouth MP Mike Hancock continues to lead accusations of a cover up. But the Sheffield name lives on. A third HMS Sheffield, built on Tyneside and commissioned at Hull, was launched on March 20th 1986 at a cost of £180 million, sister of another ship named after another lost in the South Atlantic, HMS Coventry. A 458ft submarine hunter with two Lynx helicopters on board, it toocontains fittings from the original HMS Sheffield and has inherited the nickname "Shiny Sheff"
The following section is reproduced by permission of John Hills (Pusser), HMS Juno webmaster. NAVY: Sailors, veterans and survivors take to internet to widen fight for open inquiry into why destroyer was sunk. Former crew of HMS Sheffield today backed calls for a fresh inquiry into its sinking as a Portsmouth MP urged a nationwide campaign to re-open the files. Six sailors who survived the loss of the ship in May 1982 are demanding the truth comes out about the tragedy, when 20 sailors died. Many sailors, survivors, veterans and their relatives are unhappy with the official account of the loss of HMS Sheffield and have claimed evidence at a board of inquiry was altered. An internet petition has been set up by former electronic warfare rating Doug (George) Laybourne from Widley. The good thing is that we are getting support from former Sheffield guys recently out of support we have received from all over the world, he added. Portsmouth South MP Mike Hancock, whose brother-in-law survived the destroyers loss, said the petition would show defence secretary Geoff Hoon the depth of feeling among veterans. inquiry report outlining the sinking in depth, remain closed. rule, and may stay closed even longer. DEFENCE secretary Geoff Hoon is poring over copies of the The News as local MPs urge him to reveal the truth of the loss of HMS Sheffield. The Portsmouth-based destroyer was the navys first warship lost in battle since the second world war when she was struck by an Exocet missile in May 1982. Twenty men died in the tragedy, attributed at the time by the MoD to problems with the destroyers radar. 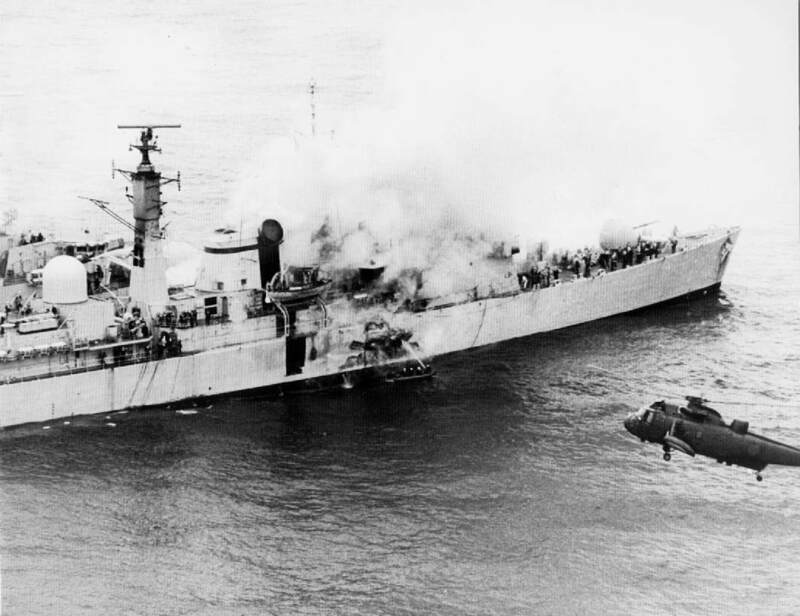 But 19 years after Sheffield went down sailors have finally spoken out about the loss, accusing the MoD of a cover up and claiming the officer in charge of defending the ship against air attack was crucially away from his post when the Argentinians began their attack run. As The News reported, Portsmouth South Lib Dem MP Mike Hancock is demanding a public inquiry into the ships loss saying there are too many unanswered questions. the truth to come out over the loss. crews allegations and asking Whitehall to look into the claims. nothing to hide, Mr Rapson told The News. We owe the truth to the families of those who lost their lives and to the rest of the crew. his knowledge of the loss of Sheffield. He learned of the claims surrounding the sinking, which surfaced this week years ago and has been critical of Whitehalls reluctance to come clean about the tragedy. have been a lot of different stories. The full story of how HMS Sheffield was sunk is not a national secret. Whitehall is being overly sensitive. We have new weapons now and so this is not as important now as it was in the Cold War. 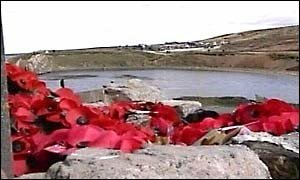 UNDER the 30-year rule the government papers on the Falklands conflict will not be released until 2013.Even then Whitehall can decide which files to release for public inspection, and which to hold back. Some papers from the second world war remain confidential in cases under the orders of wartime premier Winston Churchill. The MoD maintains that the truth about Sheffield has come out and the case is closed. VETERANS today accused the navy of a cover-up after it lost or destroyed vital documents which could hold the key to a Falklands tragedy. 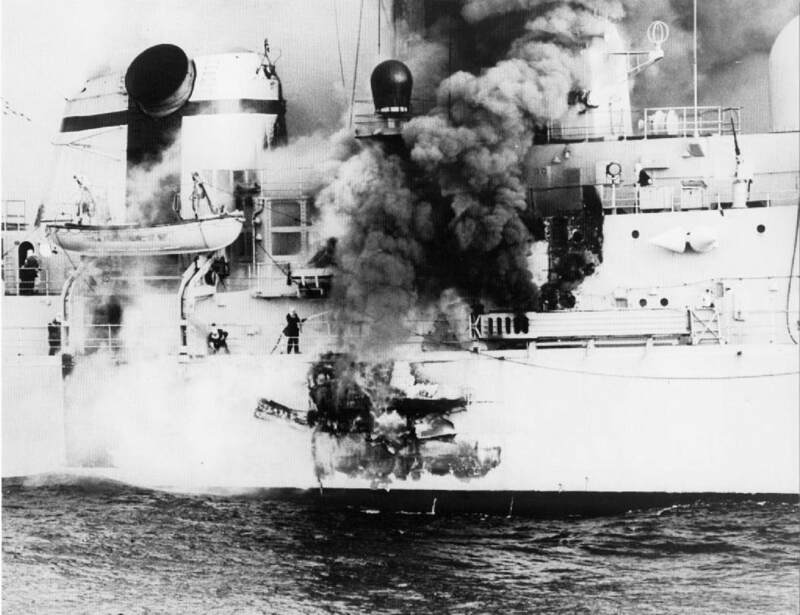 The crew of HMS Sheffield have always refuted claims that the destroyer was `asleep' when an exocet missile struck it in May 1982, killing 20 men. They say the Ministry of Defence tampered with their testimony to a board of inquiry into the sinking - something Whitehall has always denied. Now the MoD has admitted testimony from that board of inquiry has vanished from government archives - the very evidence some sailors say was altered to hide the true story of the disaster. Veterans claimed the officer in charge of defending the ship against air attack Lieutenant Commander Nick Batho - was not in the operations room when the Argentinians began their raid. All survivors were interrogated over the ship's sinking, but when a board of inquiry was held in Portsmouth, crew claim they say they were told to strike remarks about Lt Cdr Bathos whereabouts from the record. Now the MoD says the transcript of witnesses' evidence at the hearings has disappeared, although it has since admitted Lt Cdr Batho was out of the operations room for some of the attack. Crew believe the transcript will back up their claims and help absolve their shipmates of blame for the tragedy - as some historians have accused Sheffield of being asleep. Electronics warfare expert Doug Laybourne from Widley who is leading a campaign for a public inquiry into Sheffield's loss - said there was disbelief that records of a crucial moment in the navy's history were missing. dissatisfied with the MoD and am convinced there is a cover-up. Mr Hancock wants former Sheffield crewmen to contact him on (023) 9286 1055 to take their case to parliament. TWENTY people died in HMS Sheffield in the Falklands War when it was struck by an Exocet missile. · The crew have had to live with claims that the ship was 'asleep' and unprepared for the attack. · A board of inquiry met behind closed doors and absolved anyone of blame. · Veterans claimed a key officer was absent from the operations room just before the attack and his presence could have allowed the ship to make defensive manoevres. · They say when they raised this at the board of inquiry they were told to strike such remarks from the record - something they say shows there was a cover-up. · Now the documents which could prove this claim one way or the other have been lost or destroyed by the MoD. · Veterans say this means the true story of Sheffield's last moments will not be known. · They say a public inquiry into the disaster would need all the facts from 1982 and the board of inquiry files - and these no longer exist. · The MoD claims it has no policy on keeping such records in the long term. A handful of records will be released in 2013 - but not the vital testimony of witnesses which is missing. · Junior defence minister Lewis Moonie said despite the lack of files there was no evidence to suggest that any testimony by crew had been altered. into the destruction of HMS Sheffield in the Falklands War. of the ship would finally nail the myth that the Sheffield's crew should have been better prepared for a missile attack. the record by the inquiry chairman. For nearly 2 years me and some good pals, supported by MP Mike Hancock, have been seeking to persuade the MOD(N) to reopen the Inquiry regarding the loss of the destroyer in May 1982. The reason why we got involved: Veterans of that conflict and particularly , former crew, allege that their evidence given to the original Inquiry, was interfered with and possibly deleted from the records!other former crew allege they were told to alter their individual reports, to omit reference to the absence of a key officer from the Ops Room in the period just prior to the missile striking the ship! On their way back to the UK in other ships (e.g HMS Arrow). Another crew member alleges that an officer (the AAWO;then, LCDR Nick Batho now Captain!) spoke to him just before he was called into the Inquiry, in a manner suggesting "we must get our story right"! Iwas a CPO in the electronic warfare branch,serving in HMS Dryad just before the Falklands war :through my experiences as an EWD(Electronic Warfare Director) in HM ships I KNEW EXACTLY HOW A SHIP 'FIGHTS FROM THE OPS ROOM and when the media reported the destruction of the warship - I was puzzled as to how easily an unsophisticated missile could penetrate her defences! Then almost 2 years ago I read articles and saw TV documentaries in which these allegations were being made;they all added up to COVER-UP! Iwas furious! Sheff', at the bottom of the South Atlantic, far from where their families can visit their grave and grieve in private. I have witnessed 'operational defects' being supressed to keep ships at sea and some of the stupidity that has lost lives before, when there is downward pressure on crew to keep a warship going! For example: In HMS Devonshire, there was an intermittent loss of communications on an irregular basis, between the flight commander/FDO(flight deck officer and the HCO (Helicopter Controller in the ops room) that had so much potential for disaster, it should have been dealt with urgently, it wasn't! AT THE SAME TIME, In addition to the aircraft being held down to the flight deck by strops, the previous dickhead flight commander had replaced the original flimsy earthing chain, with a '10 TON breaking strain', replacement! so you can see that if that chain was not removed,the tailplane would be firmly anchored to the deck! (I often wonder If the family of the flight commander who was subsequentLY killed as a consequence of all this, know the truth! LCDRTony Van Someron was a smashin' guy, liked by his 'flight and very much respected by me . Please ask absolutely anything you want regarding Sheffield. I look in your eyes, the tears form. How can words convey the feelings that lie deep in my heart. Memories of when we first loved and laughed. How your eyes smiled when I watched you from the dock. He is mine now for 2 days. How we spent time making love. How we walked the Thames. How you made me feel like a princess. Then again at the dock. Watching you again become theirs. Tears in my eyes as I watched you walk on the ship. Damn I hated to see you go. But I had always waited for you. Then one day you did not come home. You had told me that you shall always be their property. And that I would have to share you with her. But now as I stand at the site and cry. Realize in her arms you now rest. And may HMS Sheffield protect you.